Right now I should be writing a two-page response paper comparing an element of Aristotle’s theory of the “right” and the “good” with some other philosopher’s, but instead I feel compelled to write a blog entry. a) After three semesters I have come full circle with the material that interests Prof. C, and that it’s given me a new language to express and conceptualize some of the experiences, intuitions and heretofore undetected existential effects that come bundled with urban modernity. I love that I now have a sense of the vocabulary to engage in introspection and reflection under a more formalized framework that feels more satisfying in its explanative value. b) Under Prof. S’s confident and skilful guidance, I have been given a respectable introduction to western philosophical thought in a fashion that has validated, clarified and echoed many of the things I had always wondered about or had constructed a personal morality around. c) In what I can only view as a great blessing, I have had an extraordinarily wonderful experience in my MIT seminar, in that I have not only learnt many intrinsic truths about the world and many surprising subtleties about those truths, but more importantly in that I have added to a fairly robust personal worldview based on these findings and I now feel that I have decided what I want to do in life. That latter development is especially exciting for me. People crave structure and direction, and Prof. L. has done a remarkable job at helping me feel confident about having discovered both. This list is of course by no means exhaustive, and life has its indignities, inconveniences and difficulties, but in terms of classes I can be happy that they have served the purposes that educators and students must wish they would serve – to inspire, to engage, to transform. 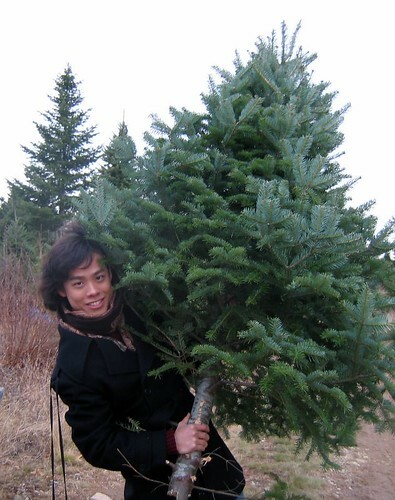 Christmas Tree Hunting (26 Nov 2005), originally uploaded by J Y.
Ryan and I picked out this lovely six-foot spruce tree at a tree farm in northern Maine near his aunt’s home in Calais. Ryan sawed it down and we drove it back down to Cambridge the next day (the car smelled amazing). Within 24 hours it was installed in our living room with lights, ornaments and all. NB: I was very inappropriately dressed in my new cashmere coat which got stained with spruce sap (anyone know to get that out?) and I later ripped one of the pockets when I slipped on a wet patch. In my defense, neither of us had planned to go traipsing out in the woods. The long Thanksgiving holiday weekend was a Godsend. I really needed the break. However, having eaten two very hearty homecooked Thanksgiving dinners (one at Libby’s place – thankyouthankyou!) and one up in Maine with Ryan’s family (the *best* turkey I’ve ever eaten, no question! ), I am now nearly three pounds heavier (eek). Actually, it may have been all the dessert pies, random drinks and candy I consumed that did it. In any case, I’m heading down to the gym, where I expect to find many other guilty students trying to redeem their pre-holiday figures. And I got a reasonable amount of work done on the five-hour ride home too (I drove on the way up and Ryan drove us back to Cambridge)! Fancy that! The fear and the suffering. And no, I’m not referring to anything more significant or less egocentric than this awful, awful, overdue, awful French paper I’m writing right now. I’ve been working at it since 6pm (it’s now close to midnight), but between 9pm and 10.40pm I don’t think I managed to write a single word. Pas d’un mot. Bleah. Final Score – Go Crimson! (20 Nov 2005), originally uploaded by J Y. 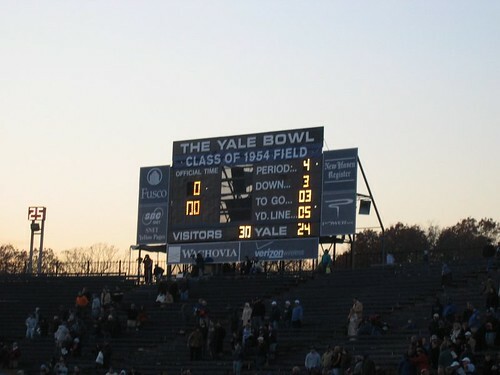 When I walked into the stadium at half-time, the score was 3-21 in Yale’s favor. 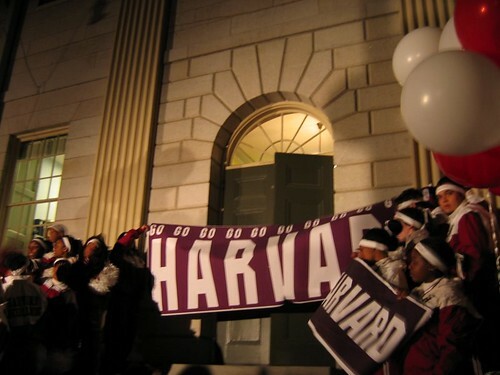 It took a while (and three tense rounds of overtime), but the team finally made good and asserted Harvard’s supremacy. Go Crimson!! The Game 2005 (20 Nov 2005), originally uploaded by J Y. 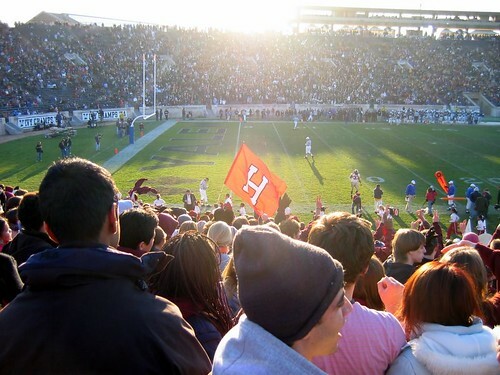 The capacity crowd at the Yale Bowl, taken from the Harvard half of the crowd, of course. 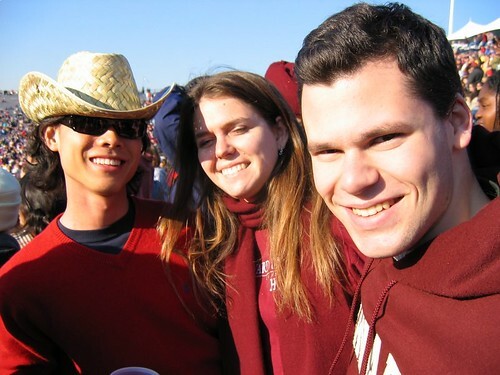 The game took over four hours, and the sun actually set just as Harvard came back and tied the score after a dismal second and third quarters. At the Game (20 Nov 2005), originally uploaded by J Y. So in case it’s not already clear, this weekend was spent in New Haven not doing the urgent work I have due in 36 hours. Pomp (17 Nov 2005), originally uploaded by J Y. But missing just a touch of circumstance. 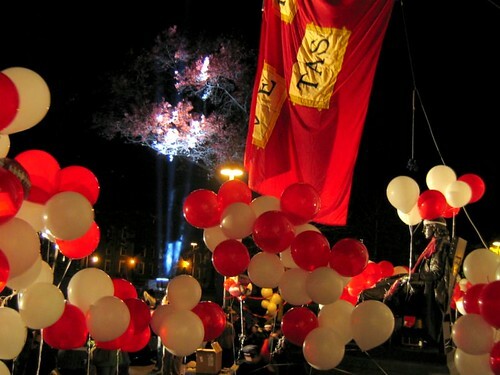 There were powerful revolving searchlights hired to give the event a festive, carnival-meets-the-Oscars atmosphere. And the band played on (17 Nov 2005), originally uploaded by J Y. 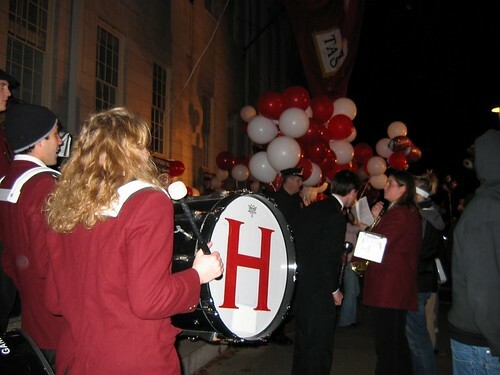 What would a Harvard football pep rally be like without a marching band? Unthinkable. All togged out (17 Nov 2005), originally uploaded by J Y. 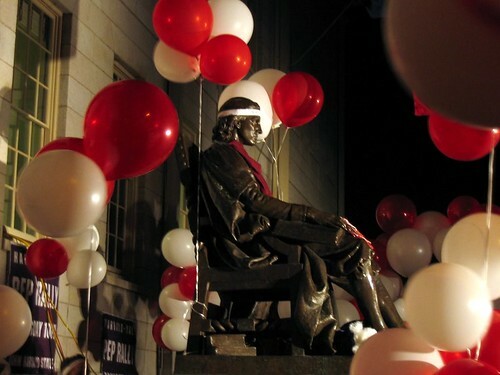 The John Harvard statue was all dressed up for the occassion too. Here they come! (17 Nov 2005), originally uploaded by J Y. Taken moments before the hefty football team came charging out of University Hall.